A new book of fictionalised 'hand me down' family stories is to be published on 29 February, the end of a long and very personal project for the author, Karen Babayan. Karen was brought up in the Armenian community of Tehran in Iran until she was 16 and then moved to the UK with her immediate family. She is now a visual artist living in Cumbria with a fascination for her family roots and for the insight that they give into a resilient community’s incredible history. The book, entitled Blood Oranges Dipped in Salt, reflects the history of the Armenians of Iran from the perspective of the author's own family. Dreams feature strongly; also births, marriages and deaths, the stuff of family life. The stories bear witness to a minority cultural with a monumental history that has experienced generations of loss, displacement, migration, immigration and assimilation. Karen Babayan has tried to bring a sense of 'here and now', creating a tangible link from the past to the present whilst trying still to retain the spirit and survival of the original tales. The title is based on an Armenian taste for oranges dipped in salt as a snack and the reference to blood oranges emphasises the strong family bonds reflected in the stories. 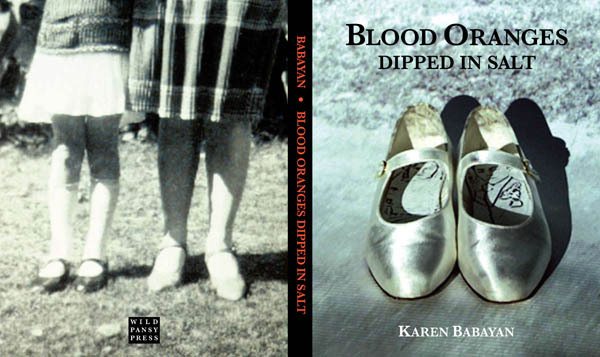 Blood Oranges Dipped in Salt is published in hardback on Wednesday 29 February by The Wild Pansy Press 2012, 150 x 184mm, ISBN 978-1-900687-40-9, priced £14.99 + P&P.